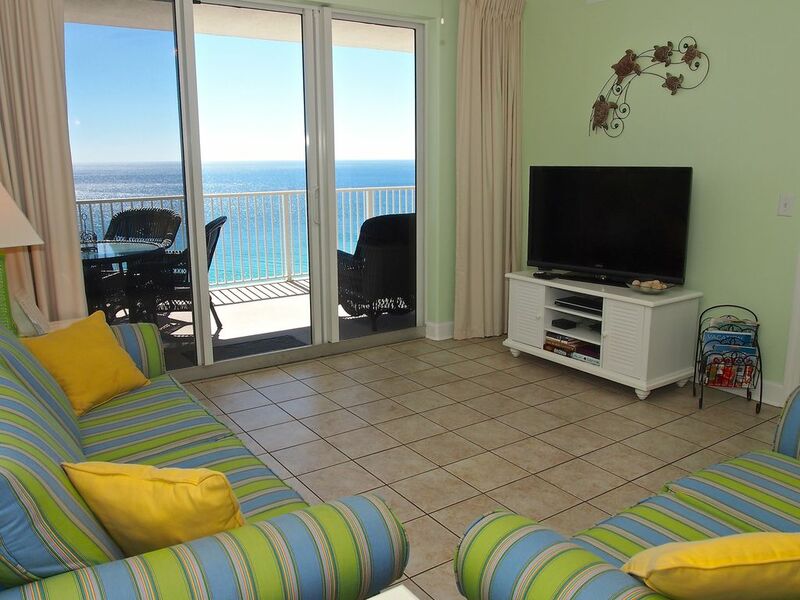 This beach-front condo offers TWO FREE BEACH CHAIRS and UMBRELLA each day of your stay! Valid between March 15th - October 31st. Tropic Winds 1904 is a brand new 2 bedroom, 2 bathroom, gulf-front penthouse unit! As far as locations go, it doesn't get much better - the complex is situated just west of Hwy 79 on the quiet west end of Panama City Beach close to Pier Park! This spacious condo features all the comforts of home with a fully equipped kitchen, high-end furnishings and contemporary beach decor. The master bedroom sits right on the Gulf and offers a king size bed, private bathroom, and endless panoramic views. The guest bedroom also has a king size bed, plenty of storage space and a connecting bathroom. Enjoy the upgraded kitchen which offers granite counter tops and brand new stainless steel appliances. The dining room table can seat up to 6 adults comfortably and there is a breakfast bar with 4 additional bar stools. The living room provides a queen size sleeper sofa, flat screen TV and DVD player. Tropic Winds units boast deeper balconies than most local condominiums providing you with additional living space. The 10 by 28 oversized balcony offers a large table that can seat up to 4, with wicker chairs and an outdoor sofa and chairs. Parking is a breeze; the owner has a designated parking spot located on the 2nd floor right by the elevator. All of our condos come fully equipped with 300 thread count linens, towels, washcloths and your first round of amenities. Always enjoy coming here. This condo has 2 king size beds that are comfortable. I love the colors the walls are painted. My favorite thing to do is sitting on the oversized deck looking for the dolphins and other fish. Very neat and clean. Fully stocked. Only 2 miles from Pier Park which makes it walkable. Location is great! Eight years in a row says. It all. This was our 8th winter fat Tropic Winds and we are booked for next year which I believe says it all. You just can’t beat Unit 1904 at Tropic Winds. It is pristine, beautifully decorated (recently remodeled) in a Key West vibe, and wonderfully appointed. In addition to the 2 awesome reserved padded beach chairs & umbrella, there are numerous extra carry-down chairs, noodles and other beach items in the unit’s laundry room to borrow. Also a pile of books and games for evenings and rainy days. The description said “one day” worth of paper products, but there were 3 of us and the supply which was provided lasted for our entire 3-night visit. Kudos to Greta’s for looking after us just before our arrival and relocating us to this wonderful unit when they learned that the balcony of our original unit was being painted during our visit. Greta’s has their finger on what’s going on at their resorts and takes good care of their customers. We will definitely be repeat customers! We totally loved our long weekend in Unit 1904. It was the best-appointed rental we have ever stayed in. Everything was neat and clean as could be. We enjoy cooking in, and found everything we needed to do so. The balcony area is huge and very inviting. We enjoyed the complimentary beach service chairs, and the &#x201C;extra&#x201D; chairs, noodles, and wake board available to borrow from the laundry room were a bonus. Tropic Winds is located near the AMAZING Pier Park, a premier shopping/dining/entertainment complex. Public fishing piers, mini-golf, water parks, bumper cars and more for the young at heart. Shopping and dining at its best within walking distance of your beach vacation. There's not much left that you won't find nearby! In addition to the Rental Rate, each reservation will include: Registration Fee: $79 Cleaning Fee: $120 (2 Bedroom Unit) or $160 (3 Bedroom Unit) or $175 (4 Bedroom 3 Bath) or $200 (4 Bedroom 4 Bath) Florida Taxes: 13% Optional Damage Insurance: $59 (up to $3,000 accidental damage) OR Damage Deposit: $400 (2 Bedroom Unit), $500 (3 Bedroom Unit), OR $600 (4 Bedroom Unit). Damage Deposit is refunded in 7 to 14 days if no damage to property.